Clubs may pay fees in the CHAWP online store if making payment online. 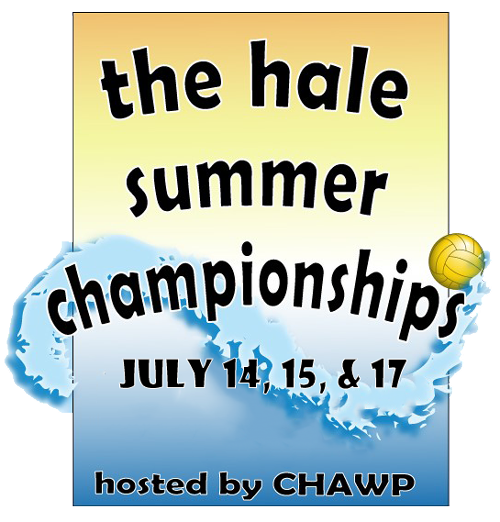 There will be two divisions for 16 and 18 boys’ age levels. This is so there will be more balanced games and less blow outs. Division 1 is for teams preparing for JO’s, out of state travel teams, and competitive high school teams. Division 2 is for club B teams and high school teams. All teams must meet age level requirements (age as of Aug 1). Exceptions at discretion of Director. All athletes, coaches, and clubs must be USWP registered for 2019. Teams can have an unlimited number of players. Some of the courses will be 25 meter with floating cages and other will be 25 yards with wall goals. Each team will be entitled to two timeouts per game. Ties in advancement games will be determined by shootouts. Ties in bracket play will be by FINA rules. Code of Conduct toward officials and scorer’s table staff will be upheld. Tournament entry fee are due no later than July 3, 2019. We suggest that your teams bring canopies for shelter from the sun because shade is limited. Any forfeits result in a $100.00 fine per game to the offending team. Games are ruled a forfeit 10 minutes after the scheduled start time or if a team does not have at least 7 players on their roster ready to play at the start. It is the responsibility of the coach or team manager to follow the tournament schedule. If your team withdrawals prior to the beginning of the tournament you must find another team to fill your spot or forfeit your entry fee. A USAWP verified roster for each team will be required prior to the tournament. Each division/age group will play in 5-6 games depending on the # of entries. Awards will be given for 1st – 3rd place for 13 players per team.